Since World War Moo, the sequel to the Terry Pratchett Prize winner Apocalypse Cow, is published today, I'm running a couple of little promos in celebration. Firstly, you can enter to win a signed and doodled copy of the book on Goodreads (entry form at the bottom of this blog). 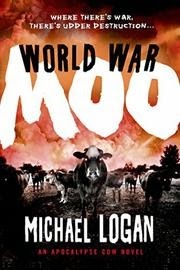 Secondly, I am giving away a free eBook with every copy of World War Moo purchased before June 16. To get your free book (Wannabes, shortlisted for the International Thriller Writers 2015 awards, and loved by dozens), send proof of purchase to freelancelogan@fastmail.co.uk, and I will send you a download code. To encourage you, below are some early reviews and the blurb for World War Moo. Now go forth and multibuy! It began with a cow that just wouldn't die. Yep. That's right. They're still infected, and now the disease has spread to humans. The epidemic that transformed Britain's bovine population into a blood-thirsty, brain-grazing, zombie horde...err... herd... is threatening to take over the globe. And there's not much time left to stop it. All of Great Britain is infected and brimming with rage. The rest of the world has a tough choice to make. Should they nuke the Brits right off the map — men, women, children, cows and all — in the biggest genocide in history? Or should they risk global infection in a race against time to find a cure? With fanatical infected trying to escape the cursed island, and the Brits ready to defend themselves with every weapon at their disposal, including an intercontinental missile sloshing with infected blood, it may only be a matter of time before the virus gets out. Giveaway ends July 05, 2015. OMG! I was so excited about WWM that starting Monday I walked though the office mooing at people. My supervisor actually played a moo sound whenever I walked by her office. I bought the book yesterday and a copy of Apocalypse Cow for my son. I am a one-woman zombie cow novel promoting enthusiast! At least you didn't turn up in a cow suit, which would have freaked everybody out. Glad you were so excited, and hope the book lives up to your expectations!